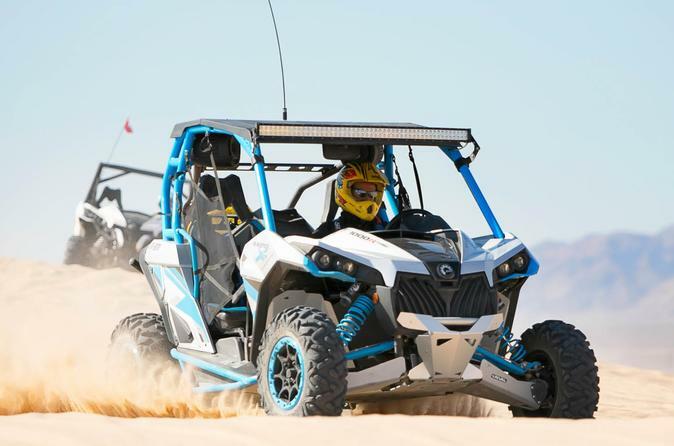 Brand New Can Am Maverick 1000 CC's Side by Side UTV's, 2 Seaters, 4 Seaters & 6 Seaters, Tours through the multi Terrain Nellis Dunes, located only 14 miles north of the "Strip"; Complimentary "Strip" Hotels pick up/return, bottled water & gear - rain or shine! Complimentary "Strip" Hotels pick up/return, 9:00 A.M., 11:00 A.M., 1:00 P.M. & 3:00 P.M.; drive or ride in a Brand New Can Am Maverick 1000 CC's Side by Side UTV's, 2, 4 or 6 Seaters, through the multi terrain Nellis Dunes, home to our Nellis Air Force Base and only 14 miles north of the Las Vegas "Strip". Approximately 2 hours door to door with bottled water, gear and instructions and techniques from professional tours guides to enhance your adventure. Tours operate 7 days a week, rain or shine; no license or passport required. On any given day, watch with jaw dropped, our Nellis Air Force Base Fighter Pilots performing aerobatics just over your head; See Vegas like never before as you tour the distinguishably celebrated Nellis Dunes.